Have you ever met anyone that doesn’t like music? Yeah, me either, but usually the next question that comes to mind is, “Where is the music?” Detroit’s rich musical roots run deep, and sometimes you might need a little guidance on where to dance the night away in the D. Thanks to two captivating women, Christie Laabs and Sadie Quagliotto, who are the masterminds behind Hip in Detroit, your Saturday night woes can turn into a sigh of relief using their guide to the best happening in the metro area. “There are so many amazing things happening in the area, it’s never been an issue of if something is happening tonight, more of a matter of who and where,” Quagliotto explained, with her partner in crime, over coffee at Great Lakes Coffee one Saturday afternoon. Quagliotto and Laabs met at the age of 12 when they both looked at each other and noticed that they were wearing the same pair of kicks. Ever since then, they’ve been a dynamic duo, scouring the metro area for all types of music and spreading the good word. 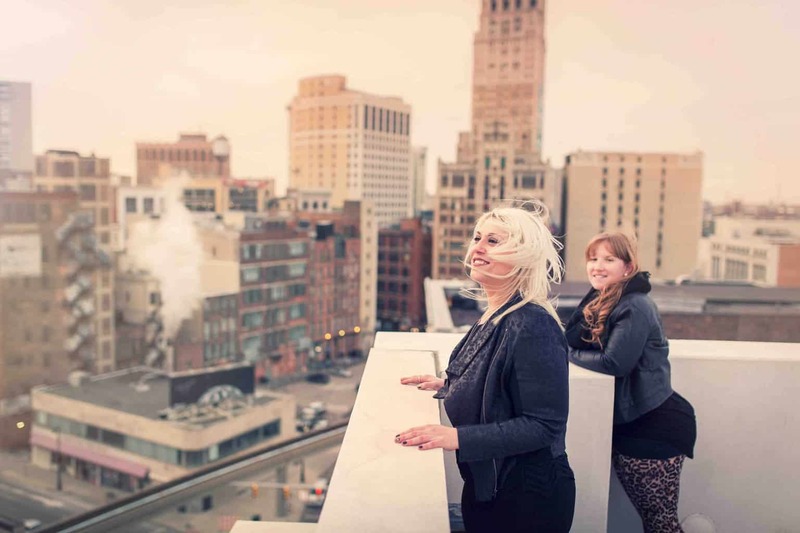 After throwing some ideas around, the two decided to create Hip in Detroit, a blog that celebrates the sounds that makes this city move, and guiding people to these events through creativity and passion for the Motor City. This year marks their three year anniversary, and they’re throwing a big ole’ bash in Hamtramck at Small’s. “We wanted to give everyone coming to the party a little bit of everything, and a bunch of free swag so were raffling off gift bags, filled with local goods from around the area after each band is done playing,” Quagliotto informed me, as we talked about the event. “The bands we picked to play this year are all unique to the city and their fans in different ways. My Pal Val adds a strong female voice to the mix, something Sadie and I are very passionate about when it comes to women in the city,” added Laabs. Alongside My Pal Val, other local acts will be taking over two stages, including sets by Radio Burns, Her Dark Host, Zander Michigan and Deastro with prizes from a plethora of Metro area companies such as The Emory, Green Dot Stables, The Fillmore and tons more of Michigan-made goodies. On Saturday, February 21, the party starts at 8 PM at Small’s, but the ladies suggest you get their early for the best chance possible to walk away with some swag. “This party gives us the great opportunity to bring one giant community together, to celebrate the city we love for one special night,” explained Quagliotto. Tagged Deastro, great lakes coffee, Green Dot Stables, Hamtramck, Her Dark Host, Hip in Detroit, My Pal Val, Radio Burns, Small's, The Emory, The Fillmore, Zander Michigan. Next:#MittenLove for All! New Logo = Freebies for You!